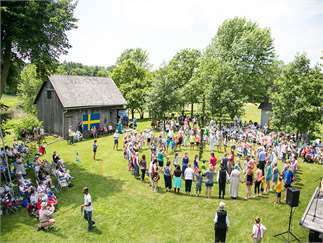 MIdsommar Dag is the most important holiday of the year and one of the most uniquely Swedish in the way it is celebrated. The Majstång (the Swedish version of a Maypole) is decorated with greens and flowers then raised in the center of town. 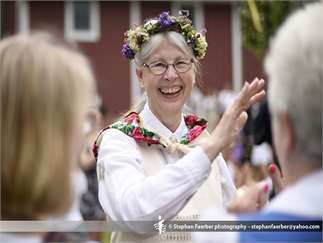 Traditional Swedish music and dances celebrate the long days of summer! • 10:00-11:00: Gazebo food sales begin – coffee, water and cinnamon rolls. • 11:00 to 12:30: New this year! 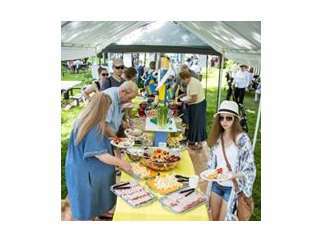 Smörgåsbord will be held on Museum grounds, $20.00 per person – no reservation needed. Children’s Dala Lunch available for $5.00. • 1:30pm Gazebo food sales resume as a “Sweet Treat Station” serving ice cream bars, almond cake, coffee, soda and water and lemonade. The Svenskarnasdag Girls Choir and Vasa Junior Folk Dancers, and will perform and lead us in the ring dances.